by making special rigid polyurethane form contain polish in its structure. make then ideal for high-load polishing. Finish-polishing of optical glass, and other glass products. Surface polishing of metallic goods such as stainless steel goods, plastics, jewelry, quartz glasses, etc. Speculum polishing of semiconductor wafers made of silicon, germanium, etc.Finish-polishing of razor blades, etc. KOKONOE CERIUM PADS result in shorter working hours and lower costs. 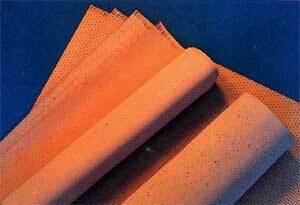 Extremely rigid quality control over the manufacturing process of KOKONOE CERIUM PADS make their quality constant. The faster polishing action of KOKONOE CERIUM PADS display excellent results in polishing a workpiece at high-speed under high-load. Nice thicknesses of 0.5, 0.8, 1.0, 1.25, 1.5, 2.0, 3.0, 4.0, and 5.0mm. Processing of adhesive tape, punching and grooving.